Background: Written action plans for asthma facilitate the early detection and treatment of an asthma exacerbation. Several versions of action plans have been published but the key components have not been determined. A study was undertaken to determine the impact of individual components of written action plans on asthma health outcomes. Methods: Randomised controlled trials (n = 26) that evaluated asthma action plans as part of asthma self-management education were identified. Action plans were classified as being individualised and complete if they specified when and how to increase treatment (n = 17), and as incomplete (n = 4) or non-specific (n = 5) if they did not include these instructions. Results: For individualised complete written action plans the use of 2–4 action points and the use of both inhaled (ICS) and oral (OCS) corticosteroid consistently improved asthma outcomes. Action points based on personal best peak expiratory flow (PEF) consistently improved health outcomes while those based on percentage predicted PEF did not. The efficacy of incomplete action plans was inconclusive because of insufficient data. Non-specific action plans led to improvements in knowledge and symptoms. Conclusion: Individualised written action plans based on personal best PEF, using 2–4 action points, and recommending both ICS and OCS for treatment of exacerbations consistently improve asthma health outcomes. Other variations appear less beneficial or require further study. These observations provide a guide to the types of variations possible with written action plans, and strongly support the use of individualised complete written action plans. Asthma is characterised by episodes of expiratory airflow obstruction which occur in response to multiple stimuli. The frequency and severity of these episodes varies greatly, both between and within individuals. Since all individuals with asthma are susceptible to exacerbations of asthma, it follows that all those with diagnosed asthma need to know how to manage these episodes. This instruction in self-management can be formalised as a written action plan, and all asthmatics are candidates for such a plan. This contrasts with the need for inhaled anti-inflammatory therapy which only becomes necessary when the frequency and/or severity of exacerbations are sufficiently great. At present, however, there is a paradoxical situation where most patients are prescribed regular inhaled corticosteroids (ICS) yet only a few either have4,5 or use6 a written action plan. A recent systematic review of asthma self-management education conducted in adults3 identified 17 randomised controlled trials (RCTs) which evaluated written action plans compared with usual care. When a patient was provided with a written action plan and instructed in its use in the context of self-monitoring and a review of asthma medications and severity, there were highly significant improvements in asthma health outcomes. The risk of being admitted to hospital for asthma fell by over 40% and presentations to the emergency department with asthma fell by over 20%(relative risk (RR) 0.78, 95% CI 0.67 to 0.91). Since action plans are highly effective when part of a planned self-management programme and many versions are available, it is reasonable to try to determine the key components of asthma action plans that make a difference to subjects with asthma. This study addresses this question. – when to seek medical help. Incomplete individualised action plans comprised a second form of asthma self-management. These plans were individualised and specified when to increase treatment, but the use of early intervention with ICS was not specified. Non-specific action plans provided general information about the management of deteriorating asthma. Action plans prescribe a level of symptoms or lung function that determines when to activate the action plan. This is termed an action point. There are several variations in action points. Action points may be based on symptoms or peak expiratory flow (PEF). PEF based action points may be based on predicted or personal best PEF. The number of action points in any written action plan can also vary, generally between two and four different levels. To determine the impact of the individual components of written action plans on asthma health outcomes, RCTs that evaluated asthma action plans were identified. An initial broad search was conducted for RCTs on asthma education as part of a wider systematic review of asthma self-management education.3 Studies were identified from the Cochrane Airways Group Clinical Trials Register which is derived from Medline, Embase, Cinahl, hand searched respiratory journals, and meeting abstracts. Bibliographies of included studies were also searched. These articles were examined to identify those that included asthma action plans as part of the intervention. The asthma action plans were classified using the criteria described above. Data were extracted independently by two reviewers. 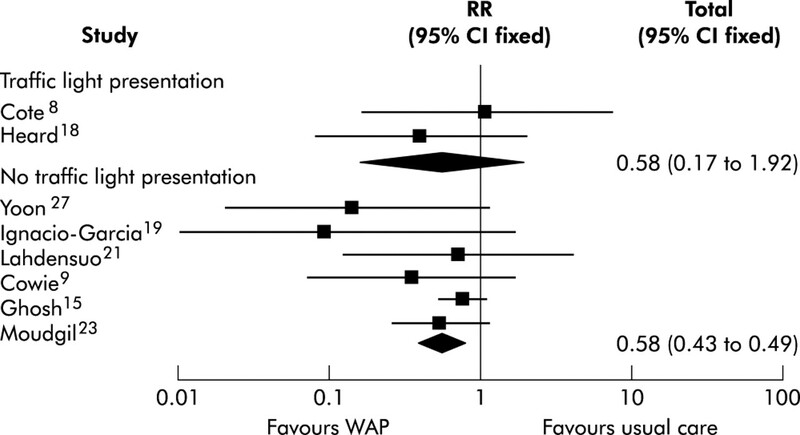 The relative risk (RR) with 95% confidence intervals (CI) was calculated for dichotomous outcomes. The RR is the probability of experiencing an outcome when treated compared with the probability of experiencing that outcome if untreated, with values of <1 indicating a favourable treatment effect. For continuous outcomes using different units of measure, a standardised mean difference (SMD) and 95% CI was calculated using a fixed effects model. Significance was accepted at p<0.05. The pooled results were tested for heterogeneity using a χ2 test with appropriate degrees of freedom. All outcomes were analysed according to the variations of the action plan and compared with a usual care control group. The variations analysed were: number of action points, personal best or percentage predicted PEF, “traffic light” action plan, or use of ICS or oral corticosteroids (OCS) alone. Full details of the individual action points for the written action plans are shown in table 2. The number and level of action points for when to increase treatment varied, but each trial gave some instruction on increasing treatment. Fifteen trials set their first action points at 70–85% of the personal best or predicted PEF value.8–15,17–27 Action plans that used a personal best PEF were used in nine trials and six used percentage predicted PEF (table S1, figs S1–S4 available online only at www.thoraxjnl.com/supplemental). When compared with usual care in a meta-analysis (five and four trials respectively), both types of action plan reduced hospital admissions (RR 0.66 for personal best and 0.46 for percentage predicted;fig 1), whereas only the action plan based on personal best PEF reduced emergency room visits (RR 0.78; fig S2). Similarly, only the personal best written action plan led to improvement in airway calibre (SMD: PEF 0.56;fig 2). Comparison of the effects of action plan components on hospital admissions for asthma. WAP = written action plan; PEF = peak expiratory flow; ICS = inhaled corticosteroids; OCS = oral corticosteroids. Comparison of the effects of action plan components on mean peak expiratory flow (PEF) in asthma. WAP = written action plan; ICS = inhaled corticosteroids; OCS = oral corticosteroids; SMD = standardised mean difference. The number of action points provided in the individualised plans ranged from two to four. Eight studies used written action plans with four action points (six that could be used in a meta-analysis), whereas seven studies used written action plans with less than four action points (three that could be used in a meta-analysis). The use of two or three action points was consistently beneficial (figs 1 and 2; also table S2 and figs S5–S7 available online only at www.thoraxjnl.com/supplemental), as was the use of four action points. Action points were presented as a “traffic light” system38 in four trials.8,10–14,18,22 This was not consistently better than a conventional action plan presentation (fig 3; also table S3 and figs S8–S10 available online only at www.thoraxjnl.com/supplemental). Comparison of the effects of different action plan presentations (traffic light versus other) on hospital admissions for asthma. WAP = written action plan. The instructions on how to increase corticosteroid treatment included the use of ICS and OCS in 13 trials and the use of OCS alone in four trials. ICS doses were increased by doubling the dose in 11 trials9–15,18–24,27 and by increasing or commencing ICS in two trials.8,25 The use of both ICS and OCS in the individualised plans was consistently beneficial (figs 1 and 2; also table S4 and figs S11–S14 available online only at www.thoraxjnl.com/supplemental). No comparison could be made with the use of OCS alone (four studies) because of insufficient data. No studies used action plans based on ICS alone. The efficacy of incomplete action plans was inconclusive as there were too few studies reporting data that could be used in a meta-analysis. Non-specific action plans led to an improvement in knowledge,33,36,37 symptoms,35,36 and reduced healthcare use in some35 but not other studies.29 Incomplete data reporting precluded meta-analysis. This study has identified the key components of asthma action plans and examined the variations possible in preparing these plans. By using meta-analyses of data from RCTs, we have compared the different variations for their effect on key asthma outcomes such as hospital admissions, emergency room visits, and lung function. The results (table 3) give clear recommendations for preparing action plans and highlight areas needing further research. Individualised action plans can be based upon the predicted PEF or the personal best PEF for that individual. Action points based on personal best PEF consistently improved health outcomes, whereas those based on percentage predicted PEF did not. With personal best PEF as the basis of the action plan, there were reductions in hospital admissions, emergency room visits, and improvement in PEF. This suggests that action points based on personal best PEF may perform better than those based on percentage predicted PEF. The likely reasons for this difference relate to individual variability in PEF results. However, significant differences between percentage predicted and personal best PEF could not be determined because of an overlap of the confidence intervals. Initial versions of written action plans recommended that the same level of PEF should be applied to all patients in order to indicate when to increase treatment. This was expressed as either percentage predicted or percentage personal best PEF. This commonly was set at 80% or 60% of the predicted peak flow value. Such a level would be inappropriate for someone with moderate asthma who could have daily variability of peak flow of up to 30%, and therefore their peak flow would regularly drop to 70% of the best during a stable period. Similarly, if there was any component of fixed airflow obstruction, the best peak flow may not reach 80% of the predicted value and the patient would be below their action point even when stable. Action plans can use a variable number of action points. The studies in this review used two, three or four action points. Action plans with four action points were not consistently better than action plans with two or three action points (table S2 available online at www.thoraxjnl.com/supplemental). Using a greater number of action points leads to a narrower range of peak flow in each of the zones which may not be feasible to use in practice. These results argue in favour of a simpler approach using two or three action points. It may be that the improved precision obtained by using four action points is offset by the greater complexity of these plans which limits patient understanding and acceptance. A number of different ways of presenting action plans have been developed to facilitate their use. These include placing written self-management guidelines on a plastic card the size of a credit card,40 using electronic diaries or computerised “expert” systems, or the “traffic light” system where the colours green, yellow and red are used to signal continue usual treatment (green), increase treatment (yellow), or to seek help urgently (red).38 RCTs were identified that examined the “traffic light” approach. Individual written action plans without a “traffic light” action plan showed consistent benefits. There were fewer studies using a “traffic light” action plan configuration. Some outcomes were beneficial whereas others were not. This probably represents a lack of power rather than a lack of efficacy (table S3 available online at www.thoraxjnl.com/supplemental). An exacerbation of asthma consists of a deterioration in both airflow obstruction and airway inflammation.41,42 It is therefore appropriate to recommend treatment with both bronchodilators and corticosteroids. A meta-analysis has confirmed the strong beneficial effect of OCS in severe exacerbations of asthma.43 The optimal treatment of mild exacerbations of asthma (forced expiratory volume in 1 second >60% predicted) is less clear. Current management practices include increased β2 agonists, ICS, and OCS. A recent randomised trial conducted in a primary care setting compared fluticasone 1 mg twice daily with prednisone (40 mg daily and reducing). Treatment of a mild exacerbation with ICS had a comparable success rate to the use of ingested prednisone (48%v 48%). There was a surprisingly high rate of treatment failure in both groups (27% and 23%, respectively).44 This failure rate may reflect inadequate doses, inadequate duration of treatment, or non-eosinophilic exacerbations.45 Doubling ICS was found to be less effective than OCS in another trial.46 The studies in this review support a combined approach where both ICS and OCS are used in the action plan. This review has used data derived from RCTs of asthma self-management programmes where written action plans were a key component. There are a number of limitations that need to be considered when reviewing these data. In some cases there were insufficient studies to allow a comparison and hence a type II error is possible. Where this is the case—for example, in the comparison of OCS with ICS and OCS—we have been cautious in our interpretation of the data, reported the number of studies contributing to the meta-analysis, and only reported on outcomes where several studies contributed data. There are likely to be differences in the way the different self-management programmes were implemented. This does not seem to have a major impact on the results since there was no statistical heterogeneity identified in the key results. The provision of individualised written action plans is of benefit to patients with asthma. Effective plans can be based on symptoms or PEF and use two, three or four action points. PEF based plans should use personal best PEF for the action point. The treatment instruction should include both ICS and OCS. With the data available, there was no clear distinction between other variations in the components of asthma action plans such as whether they were based on a traffic light system, the number of action points, or use of ICS alone or OCS alone. For these variations to be fully evaluated they need to be compared directly with each other, not a control group, in a randomised controlled trial setting of individualised written action plans. The observations of this review provide a guide to the types of variations possible with written action plans and strongly support the use of individualised complete written action plans. The authors acknowledge the Cooperative Research Centre for Asthma, Hunter Area Health Service - Chronic Disease Management Project. Chan-Yeung M, Chang JH, Manfreda J, et al. Changes in peak flow, symptom score and the use of medications during acute exacerbations of asthma. Am J Respir Crit Care Med1996;154:889–93. Turner MO, Noertjojo K, Vedal S, et al. Risk factors for near fatal asthma. Am J Respir Crit Care Med1998;157:1804–9. Gibson PG, Powell H, Coughlin J, et al. Self-management education and regular practitioner review for adults with asthma (Cochrane review). In: The Cochrane Library, Issue 1. Oxford: Update Software, 2003. Matheson M, Wicking J, Raven J, et al. Asthma management: how effective is it in the community? Intern Med J2002;32:451–6. Hartet TV, Windoss HH, Peebles RS Jr, et al. Inadequate out-patient medical therapy for patients with asthma admitted to two urban hospitals. Am J Med1996;100:386–94. Marks GB, Burney PG, Premaratne UN, et al. Asthma in Greenwich UK: impact of the disease and current management practices. Eur Respir J1997;10:1224–9. Hargreave FE, Dolovich J, Newhouse MT. The assessment and treatment of asthma: a conference report. J Allergy Clin Immunol1990;85:1098–111. Cote J, Cartier A, Robichaud P, et al. Influence on asthma morbidity of asthma education programs based on self-management plans following treatment optimisation. Am J Respir Crit Care Med1997;155:1509–14. Cowie RL, Revitt SG, Underwood MF, et al. The effect of a peak flow-based action plan in the prevention of exacerbations of asthma. Chest1997;112:1134–8. Gallefoss F, Bakke PS, Kjaersgaard P. Quality of life assessment after patient education in a randomized controlled study on asthma and chronic obstructive pulmonary disease. Am J Respir Crit Care Med1999;159:812–7. Gallefoss F, Bakke PS. How does patient education and self-management among asthmatics and patients with chronic obstructive pulmonary disease affect medication? Am J Respir Crit Care Med1999;160:2000–5. Gallefoss F, Bakke PS. Impact of patient education and self-management on morbidity in asthmatics and patients with chronic obstructive pulmonary disease. Respir Med2000;94:279–87. Gallefoss F, Bakke PS. Cost-effectiveness of self-management in asthmatics:a 1 year follow-up randomized, controlled trial. Eur Respir J2001;17:206–13. Gallefoss F, Bakke PS. Patient satisfaction with health care in asthmatics and patients with COPD before and after patient education. Respir Med2000;94:1057–64. Ghosh CS, Ravindran P, Joshi M, et al. Reductions in hospital use from self management training for chronic asthmatics. Soc Sci Med1998;46:1087–93. Grampian Asthma Study of Integrated Care (GRASSIC). Effectiveness of routine self monitoring of peak flow in patients with asthma. BMJ1994;308:564–7. Hayward SA, Jordan M, Golden G, et al. A randomised controlled evaluation of asthma self management in general practice. Asthma Gen Pract. 1996;4:11–13. Heard AR, Richards IJ, Alpers JH, et al. Randomised controlled trial of general practice based asthma clinics. Med J Aust1999;171:68–71. Ignacio-Garcia JM, Gonzalez-Santos P. Asthma self-management education program by home monitoring of peak expiratory flow. Am J Respir Crit Care Med1995;151:353–9. Jones KP, Mullee MA, Middleton M, and the British Society Research Committee, et al. Peak flow based asthma self management: a randomised controlled study in general practice. Thorax1995;50:851–7. Lahdensuo A, Haahtela T, Herrala J, et al. Randomised comparison of guided self-management. BMJ1996;312:748–52. Levy ML, Robb M, Allen J, et al. A randomized controlled evaluation of specialist nurse education following accident and emergency attendance for acute asthma. Respir Med2000;94:900–8. Moudgil H, Marshall T, Honeybourne D. Asthma education and quality of life in the community: a randomised controlled study to evaluate the impact on white European and Indian subcontinent ethnic groups from socioeconomically deprived areas in Birmingham, UK. Thorax2000;55:177–83. Perneger TV, Sudre P, Muntner P, et al. Effect of patient education on self-management skills and health status in patients with asthma: a randomized trial. Am J Med2002;11:7–14. Schermer TR, Thoonen BP, van den Boom G, et al. Randomized controlled economic evaluation of asthma self-management in primary health care. Am J Respir Crit Care Med2002;166:1062–72. Sommaruga M, Spanevello A, Migliori GB, et al. The effects of a cognitive behavioural intervention in asthmatic patients. Monaldi Arch Chest Dis1995;50:398–402. Yoon R, McKenzie DK, Bauman A, et al. Controlled trial evaluation of an asthma education program for adults. Thorax1993;48:1110–6. Zeiger RS, Heller S, Mellon MH, et al. Facilitated referral to asthma specialist reduces relapses in asthma emergency room visits. J Allergy Clin Immunol1991;87:1160–8. Bailey WC, Kohler CL, Richards JM, et al. Asthma self-management: do patient education programs always have an impact? Arch Intern Med1999;159:2422–8. George MR, O’Dowd LC, Martin I, et al. A comprehensive educational progamme improves clinical outcome measures in inner-city patients with asthma. Arch Intern Med1999;159:1710–6. Knoell DL, Pierson JF, Marsh CB, et al. Measurement of outcomes in adults receiving pharmaceutical care in a comprehensive asthma outpatient clinic. Pharmacotherapy1998;18:1365–74. Kotses H, Stout C, McConnaughty K, et al. Evaluation of individualized asthma self-management programs. J Asthma1996;33:113–8. Abdulwadud O, Abramson M, Forbes A, et al. Evaluation of a randomised controlled trial of adult asthma education in a hospital setting. Thorax1999;54:493–500. Bailey WC, Richards JM, Brooks CM, et al. A randomised trial to improve self-management practices of adults with asthma. Arch Intern Med1990;150:1664–8. Kotses H, Bernstein IL, Bernstein DL, et al. A self-management program for adult asthma. Part 1: Development and evaluation. J Allergy Clin Immunol1995;95:529–40. Mulloy E, Donaghy D, Quigley C, et al. A one-year prospective audit of an asthma education programme in an out-patient setting. Ir Med J1996;89:226–8. Snyder SE, Winder JA, Creer TL. Development and evaluation of an adult asthma self-management program: wheezers anonymous. J Asthma1987;24:153–8. Lewis CE, Rachelefsky G, Lewis MA, et al. A randomised trial of asthma care training for kids. Pediatrics1984;74:478–86. Powell H, Gibson PG. Options for self-management education for adults with asthma (Cochrane review). In: The Cochrane Library, Issue 1. Oxford: Update Software, 2003. D’Souza W, Crane J, Burgess C, et al. Community-based asthma care: trial of a “credit card” asthma self-management plan. Eur Respir J1994;7:1260–5. Gibson PG, Wong BJO, Hepperle MJG, et al. A research method to induce and examine a mild exacerbation of asthma. Clin Exp Allergy1992;22:525–32. Pizzichini MM, Pizzichini E, Efthimiadis A, et al. Asthma and natural colds. Inflammatory indices in induced sputum: a feasibility study. Am J Respir Crit Care Med1998;158:1178–84. Rowe BH, Keller JL, Oxman AD. 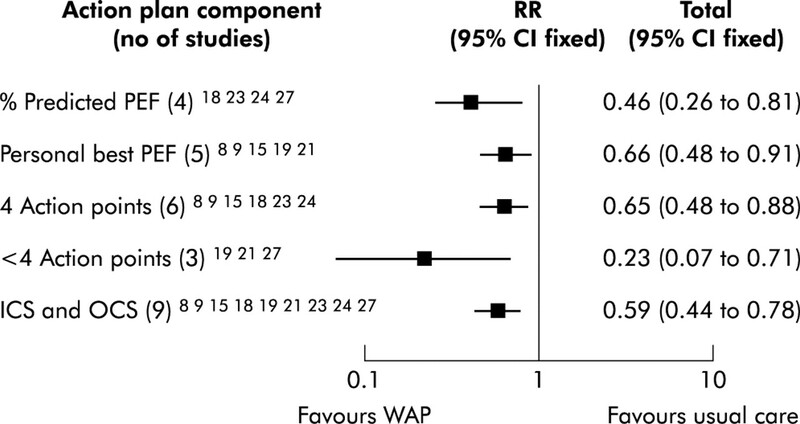 Effectiveness of steroid therapy in acute exacerbations of asthma: a meta-analysis. Am J Emerg Med1992;10:301–10. Gibson PG. Corticosteroids—clinical applications: exacerbations of asthma in adults. Aust Prescr1996;19:44–6. Turner MO, Hussack P, Sears MR, et al. Exacerbations of asthma without sputum eosinophilia. Thorax1995;50:1057–61. Fitzgerald JM, Shragge D, Haddon J, et al. A randomized, controlled trial of high dose, inhaled budesonide versus oral prednisone in patients discharged from the emergency department following an acute asthma exacerbation. Can Respir J2000;7:61–7. Beasley R, Cushley M, Holgate ST. A self management plan in the treatment of adult asthma. Thorax1989;44:200–4. Charlton I, Antoniou AG, Atkinson J, et al. Asthma at the interface: bridging the gap between general practice and a district hospital. Arch Dis Child1994;70:313–8. British Thoracic Society. The British guidelines on asthma management: 1995 review and position statement. Thorax1997;52 (Suppl 1) :S1–20. Woolcock A, Rubinfeld AR, Searle P, et al. Asthma management plan. Med J Aust1989;151:650–3. The tables and figures are available as downloadable PDFs (printer friendly files). Thorax 2004; 59 87-87-a Published Online First: 03 Feb 2004.